Just a quick update before I get back to my regular blog. Barb and Rick Klug of Wausau went to Medford today to assess the situation. They took along a large box just in case they were able to catch any of the geese. They took a large sack of feed with them. It turns out Rosie and Don Pederson of Medford arrived about the same time as the Klugs. Rosie and Don brought food as well. 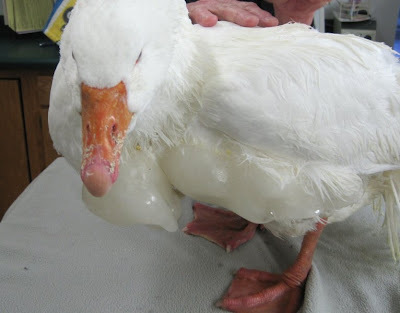 The weak and injured goose was encased in ice. The goose knew Rosie and Don from previous feeding trips and came to them. With the permission of the terrific Medford Police Department, they grabbed her up, got her into the box and the Klugs were on their way to Antigo with the bird. I want to give a special nod here to the Medford Police Department. I talked with them over the years about some problems that have occurred on Mill Pond. They are not only responsive to abusive actions that have occurred in the past but keep a close eye on the birds. A big thank you to them for their help. There are still seven geese on the Eau Claire River in the area. The Pedersons and some other kind folks are going to continue to feed them when they can for as long as the water stays open, but if anyone has any good ideas for placement please let us know. The goose is now free of ice, has been blown dry with a hair dryer. Her wounds on her back and neck and eye caused by a dog, have been tended. She is recovering as I write this piece. Thanks so much to everyone that responded. While this is beyond the scope of my wildlife work, I feel it is a human responsibility to try to prevent the inhumane death of any creature. I grow weary of those that bow out of helping in these cases because it is not their "job". Sometimes you just have to "do the right thing". 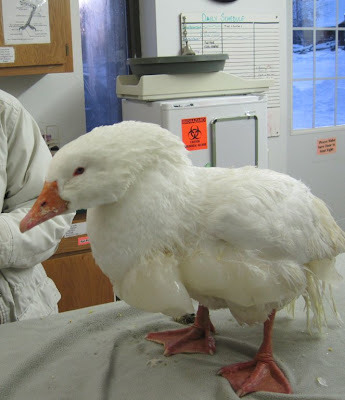 In this case...getting a poor injured domestic goose from frozen water hours before it would have been too late, was the humane and right thing to do. Perhaps a needed step to stop "dumping" of geese and ducks in ponds etc is to encourage retailers to stop advertising any animal... bunnies, ducklings, goslings or chicks as Easter gifts. These animals quickly outgrown a yard. The alternative is to euthanize, find a home or "dump" the animal in some public park. It is irresponsible to get or give an animal to a child as a "Easter toy". We are teaching children irresponsibility, not respect for the world around them. We need to do better. Our society reflects that need. Off my soapbox for now and back to my wildlife blog. It has been a busy holiday weekend.